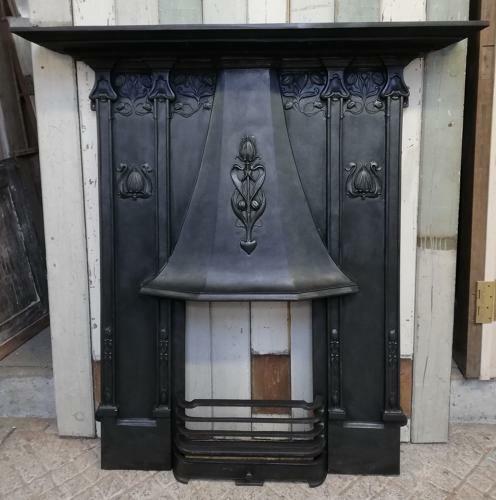 A very large and imposing reclaimed cast iron fire surround. The surround is a modern reproduction of an Arts and Crafts design, with art nouveau influence. The fire is very decorative with a large attached, shaped, smoke hood with a beautiful flower and leaf design. The same design is featured on the legs and under the mantel. The fire has decorative 3D mouldings running down the legs. The fire comes with the original front bars and ash pan and the fire is supplied with a small fire stool. The iron has been blacked and polished and has an attractive finish. The fire is in very good reclaimed condition. There are some slight signs of wear with some very small areas of surface rust to the mantel edges and surface rust to the back as expected. There are some slight marks and light knocks. PLEASE NOTE the fire is extremely heavy and would be difficult to deliver. Please contact us to discuss collection or delivery. The fire is an unusual and very attractive item that would make a fantastic feature within a home.